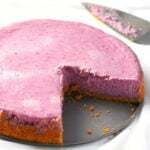 Ube Taisan is a plain and simple version of an ube cake but it is definitely a delightful treat on its own. Topped with grated cheese and sugar, every slice of this is heaven! A few weeks ago, I was at a local bakeshop here in our city to buy ube cake for my father’s birthday. While I have had their ube cake many times, it was my first time to be inside the bakeshop. 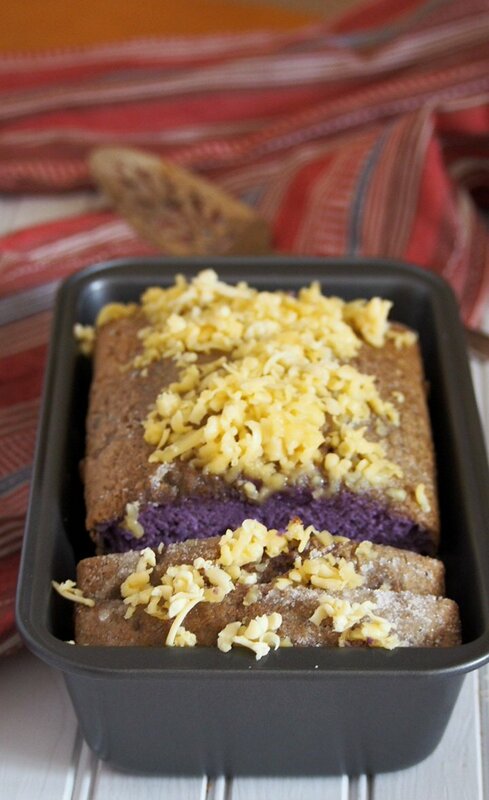 As I have mentioned in this post, their ube cake is the most sought-after. The best in the city, it seems. And when I saw what it is like inside their little bakeshop, I was amazed. I was expecting to see the usual stuff: cakes and pastries neatly arranged on the transparent display shelves, costumers going in and out occasionally, and a calm, bakeshop ambiance. But everything is far from what I pictured it. Inside that little space is a busy paradise of filled with fast-moving bakers and a long line up of people wanting to take home their baked goodies. My favorite part is how you can actually see the action: bakers frosting the cakes, walking hastily with freshly baked chiffon cakes in their hands, and the huge amount of buttercream icings being carried out in big containers. While some may see this sight as chaotic, to me it is paradise. I love seeing the behind the scenes of a bake shop. I love seeing the passionate makers of the cakes and how they lovingly decorate the cakes like masterpieces. I used to dream of having my own bakeshop or working in one, but the dream was easily dismissed. I realized it fast enough that I am not up to large-scale baking. Hot kitchens. Big ovens. Fast paced environment. No. But nevertheless, the sight of the busy bakeshop entertained the baking nerd in me. What I am up to is baking in the comfort of our own little kitchen. I am that person who craves a lot of pastries, turn to the internet for recipes and experiments with them. I love the waiting game when I put something in the oven. Is it gonna turn out okay ?or is it another baking disaster? 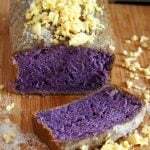 Just like this instance, I craved Ube Taisan. Seeing a taisan recipe I can adapt, I happily pranced to the kitchen and baked away. Taisan is a Filipino chiffon cake that is topped with a generous sprinkling of sugar, then topped with grated cheese. Even though it is not frosted in a fancy way, the taisan cake is one of the well-known native cakes, being sold at every bake shop back home. 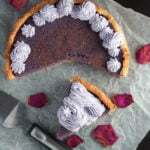 One bite and you will see, this simple and plain looking cake is actually an addictive ube delight. McCormick Ube flavoring can be bought in Asian/ Oriental groceries or you can order from Amazon. When separating egg whites from the egg yolks, make sure that the whites are free of any contamination of the yolks or any oil and water. Any contamination can prevent it from being whisked to its full volume as a meringue. Make sure that the mixing bowl where you will beat the egg whites is clean and has no trace of oil or water too. A good sign to know when your meringue (egg whites) is ready is when firm pointed peaks are forming you lift the beater off the mixture. To test it further, turn the bowl upside down carefully. The meringue should not drip down. Do you like ube? Try these recipes too! Preheat oven to 325 F. Prepare a 9x5 loaf pan by greasing it lightly with butter. In a bowl, sift together the cake flour, baking powder, and salt. Set aside. In another bowl, stir together the yolks, ube flavoring, 1/4 cup sugar, milk, water, melted butter and vegetable oil. Use an electric mixer and beat the ingredients at low speed just until combined. Add the dry ingredients and continue beating until the batter is smooth. This should take about 2-3 minutes. Set aside. In another bowl, use a clean beater and beat the egg whites using medium speed until frothy. Increase the speed and add the cream of tartar. Continue to beat until soft peaks are formed. Gradually add 1/2 cup of sugar until firm peaks are formed. Fold the egg whites into the yolk batter using a rubber spatula, gently adding 1/3 of the meringue at a time. The batter should be uniform in color. Pour batter into the prepared loaf pan and bake at 325 F for 35-40 minutes. Let cool slightly before removing from the pan. Transfer to a serving plate and brush with melted butter, sprinkle with sugar and grated cheese. I love Filipino desserts, this one is interesting with the cheese topping on top. 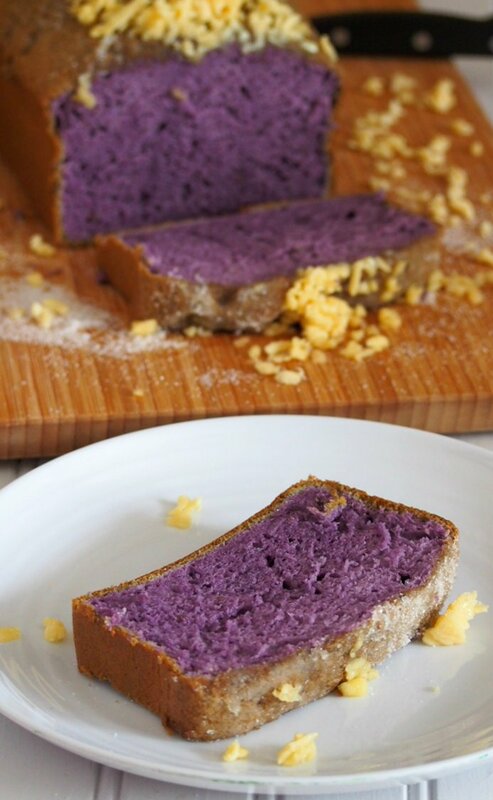 And I am amazed that the cake looks so bright purple w/o actual ube but just the flavoring? I will need to try your recipe, thanks! Hi Sharon! Yes, as a substitute for the real ube, the ube flavoring does a really good job! 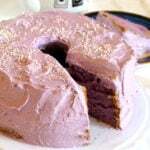 I love baking with it when incorporating real ube into the cake may seem tricky. Hi , i noticed the richness purplish color of your cake. 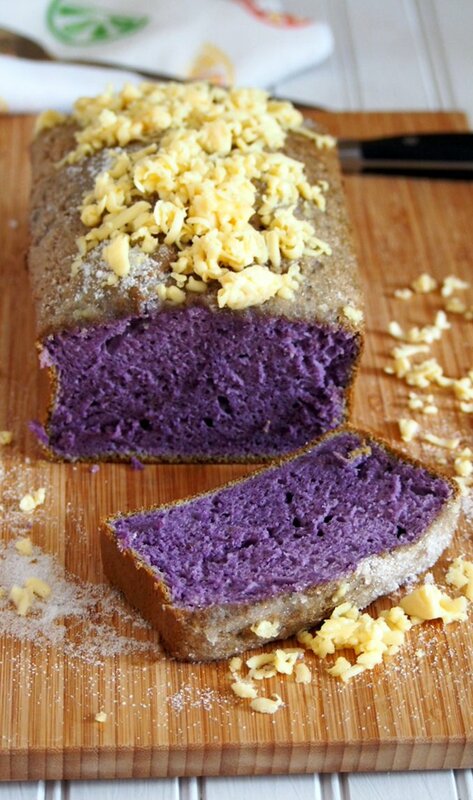 I tried to bake ube cake but i dont fet the desired color tht i want. What is your secret beside using McCormick flavoring? Thank you. Hello! I rarely add food color when using ube flavorings. Most often, the depth of the color of the yolks affects the color of the cake. Too orange and the purple color will be dull. I hope that helps. I also find that using the real ube yields a less purple cake. 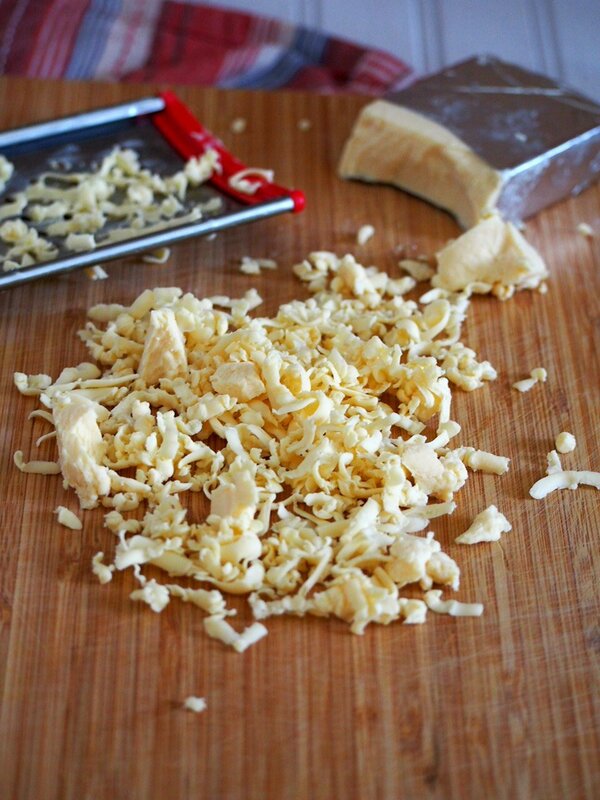 What type of cheese do you use for topping? Looks yum ….! If i have the real ube halaya what is the proper measurement for it …! Thankyou …. looking forward for your reply …! Hello Ann! 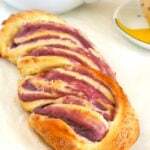 Unfortunately, I have not tested using pure ube halaya with this recipe so I can’t give you a rough estimate as of now.